Donald Trump won the district by 12 percentage points in 2016. CHARLOTTE, North Carolina — If there's going to be a Blue Wave next week, it's going to rush through places like North Carolina's 9th Congressional District. Donald Trump won there by 12 points and a Democrat hasn't been elected to Congress from the district since 1962. But now the race is a toss up because of the same educated, suburban women who for decades have voted reliably Republican. Then Trump was elected. And in the days after the Women's March, Carolyn Eberly felt she had to do more. So from the comfort of her suburban Charlotte, North Carolina, home, she typed a Facebook invitation to friends to get involved. She had no idea how that simple, spontaneous decision would change her life. Three women came. And even as their numbers grew, one political operative dismissed the band of volunteers as "silly girls." That group, Indivisible NC9, has gotten the last laugh. It now has more than 1,200 members working to elect Democrats. Carol Johnstone and Caroline Bouchard are among those who are part of this new narrative. They just spent a sunny, Sunday afternoon going door-to-door for Democrat Dan McCready, who is facing off against Republican Mark Harris. Neither was politically active before, but both are now volunteering several days a week. Johnstone said she is reacting to her own post-election fear. "For the first time I felt as though my rights as a woman could be taken away," she said. They knocked on Cary's door. She tells them she's the daughter of a conservative pastor and mother of young girls, but for the first time ever, plans to vote for a Democrat. "Sometimes, I think being conservative it's our way or the highway. But I think we're in a time where we've got to work it out," she says thoughtfully, adding she believes many of her Republican women friends feel the same. Her dad told her, "I think that God understands that things are different now." Cary is another part of this new narrative: women who wonder aloud where kindness and civility have gone. They are women who worry about their daughter’s futures. They are re-thinking what it means to be a Republican in Trump's party. At Indivisible NC 9, members are Democrats, Republican and independents. About 70 percent are women. Asked what made them come out on a glorious afternoon, almost all could point to a single incident that motivated them to get involved. A blind woman says she took it to heart when Trump mocked a disabled journalist. "And I said I can't see but I have a voice and I'm going to stand up to this." Another voter with family in Puerto Rico said her moment came because, "My family spent almost a year without power and all he (Trump) could do is throw paper towels." 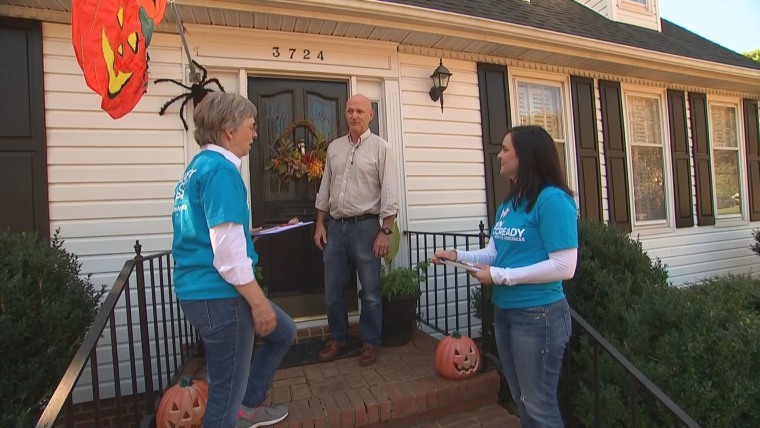 After telling their stories, the NC 9 volunteers then broke in to groups: Going door-to-door; hand addressing postcards; and sending text messages to get out the vote. But what if their candidate doesn't win on November 6th? They promise they won’t stop fighting for change. "I feel like we have to keep up the momentum," Eberly said. "We already have a meeting scheduled for later in November." Chris Jansing, an Emmy Award-winning journalist, is MSNBC’s Senior National Correspondent and anchor. She was previously NBC's Senior White House correspondent, reporting for NBC Nightly News with Lester Holt, the Today Show, and MSNBC programs from "Morning Joe" to "Rachel Maddow." Jansing joined NBC News in 1998.